There are a million variations of Seafood Gumbo and every from New Orleans will swear their way is the best. I don’t profess to have the best, so here I’m following one of Emeril’s recipe. For a Northerner like me, I think his is the absolute best! This particular version comes from Every Day’s A Party, by Emeril Lagasse, with Marcelle Bienvenu and Felicia Willett, William Morrow and Company, Copyright, 1999. Combine the oil and flour in a large cast-iron Dutch oven or large heavy pot over medium heat. Stirring slowly and constantly, make a dark brown roux, the color of chocolate, 20 to 25 minutes. Add the onions, bell peppers, celery, salt, cayenne, and bay leaves. Cook, stirring occasionally, until very soft, about 10 minutes. Add the stock, and stir to blend with the roux. Reduce the heat to medium-low and simmer uncovered for 1 1/2 hours. Add the shrimp and crabmeat and cook for 15 minutes. Add the oysters, green onions, and parsley and cook until the edges of the oysters curl, 2 to 3 minutes. Remove from the heat and discard the bay leaves. 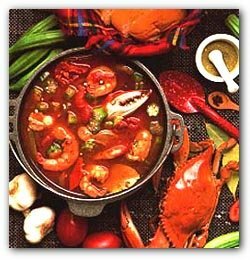 Serve immediately ladled into soup bowls over Shrimp and Ham Jambalaya, or over steamed long-grain rice. Heat 1 tablespoon of canola oil in a large sauce pan. Add the sliced sausage and cook until the sausage is brown. About 5 minutes. Remove the sausage with a slotted spoon and set aside. Add another 1 tablespoon of canola oil and sauté onion, celery, and green bell pepper for 3 minutes or until they begin to soften. Add the garlic and cook for another 5 minutes. Stir in the cooked sausage, beans, onion salt, pepper and Tabasco and simmer while cooking the rice. Bring the chicken stock and water to a rapid boil. Add the rice and butter and return to a boil. Then reduce to a simmer, cover and cook for 20-25 minutes until the rice has absorbed all the liquid. 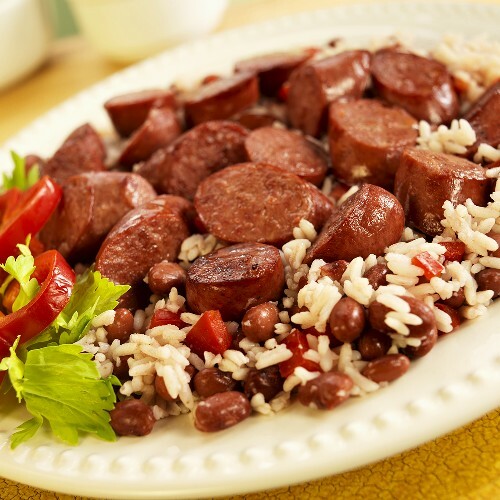 Fold the rice and beans together. Garnish with parsley.